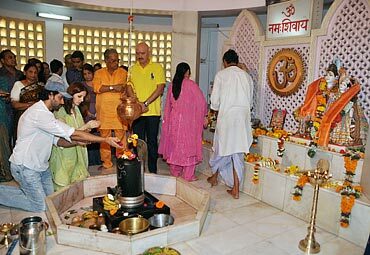 Hrithik Roshan and his family visited a Shiv temple in Panvel, which is 22 km from Mumbai, to conduct a pooja on the ocassion of Mahashivratri on Wednesday. The actor has been making this annual trip for the past 12 years. This year, he was accompanied by his father Rakesh Roshan, mother Pinky, sister Sunaina, brother-in-law Mohan Nagar, wife Sussanne and sons Hrehaan and Hridhaan. Hrithik's maternal grandfather J Om Prakash has a farmhouse in Barapada village in Panvel. The farmhouse houses a Shiv temple. Every year, Hrithik visits the temple on Mahashivratri, does a pooja, and serves food to the poor. The temple has become a tourist spot, ever since it was built in 1980. Apparently, Hrithik's grandfather had asked him to help with the langars (feeding the poor), which are held twice a week at the temple. 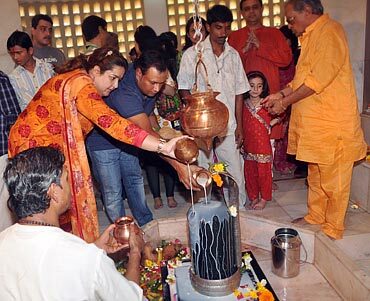 Due to the actor's busy schedule, he cannot make the trip so often but makes it a point to visit on Mahashivratri. Apparently, all the Roshans -- including aunts, uncles and cousins -- would meet up at the farmhouse on Mahashivratri when Hrithik was a child.